In a healthy brain (left), neuronal cells “wait their turn” to mature into their assigned roles, ensuring an orderly structure. 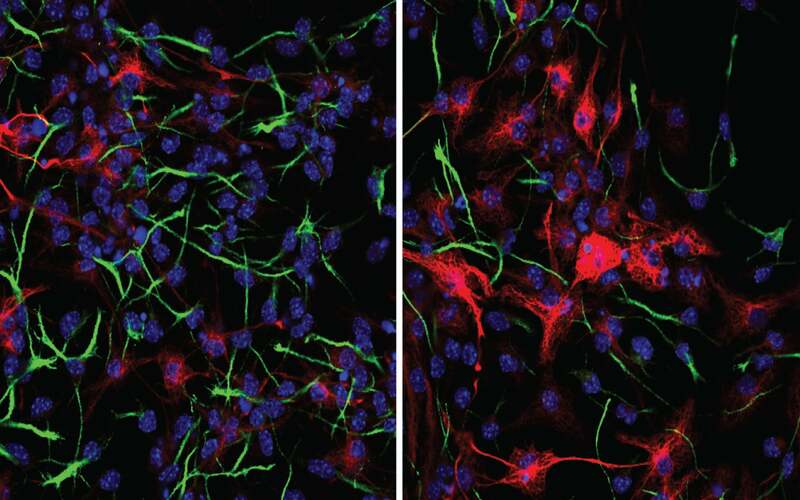 In the absence of CHD5 (right), neural stem cells are activated prematurely, leading to an imbalance of mature neural cell types in the brain. Without the protein CHD5 acting as a gatekeeper, neural stem cells prematurely activate, pushing them down the wrong developmental path and causing problems in the brain. Cold Spring Harbor, NY — Perfectly normal events can have disastrous consequences when they happen at the wrong time. 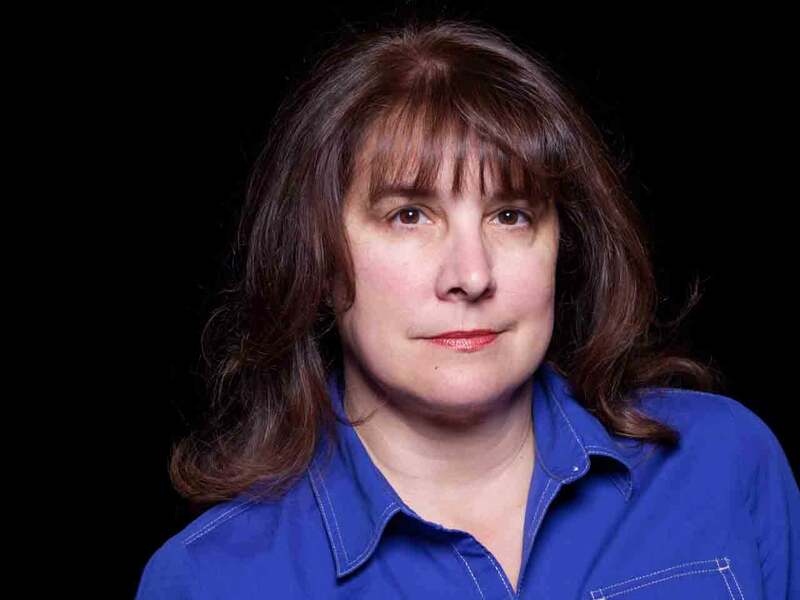 Take, for example, a horse race, says Cold Spring Harbor Laboratory Professor Alea Mills. The action begins when the competitors are allowed to burst forth from the starting gate. But if a gate is broken, allowing one stallion to rush out before the others, chaos ensues. “There is total havoc and the entire race is over,” Mills says. Protein CHD5 is an important regulator of neural cell development in the normal brain (+/+). Recent work in Alea Mills’ lab showed that in the absence of CHD5 (Chd5-/-), neural stem cells (NSCs) are activated prematurely, leading to an imbalance of mature neural cell types (astrocytes and neurons). Such imbalances may lead to brain cancers (e.g., glioblastoma). Illustration by Julia Kuhl, Cold Spring Harbor Laboratory. 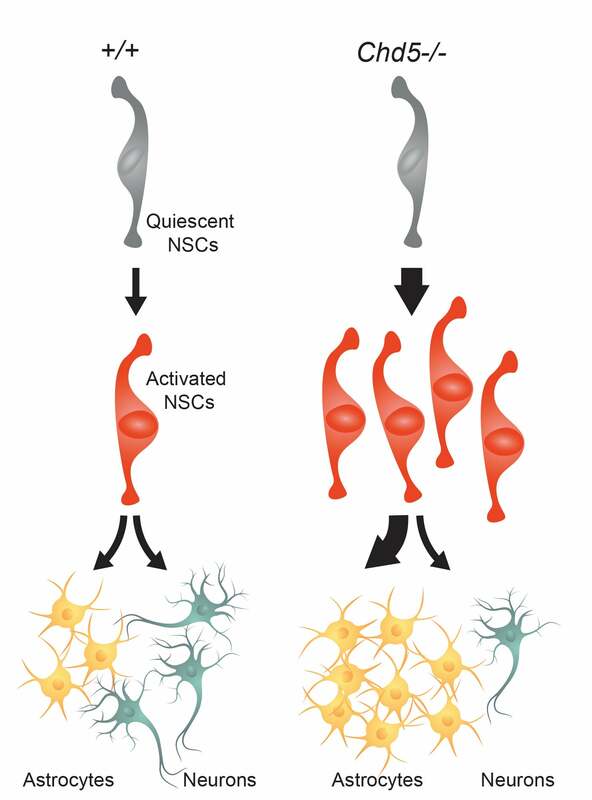 The stem cells in question are neural stem cells, which remain mostly inactive until they receive cues that direct them to develop into specific cell types. Typically, about half will become neurons, which transmit information, while others develop into supporting cells called astrocytes, which play a maintenance and repair role. Mills says a protein her team studies, called CHD5, acts as a gatekeeper to keep neural stem cells under control until the appropriate signals arrive. When that gatekeeper is missing, a whole series of events unfold sooner than they should. Experiments led by Dong-Woo Hwang, a former graduate student in the Mills lab, revealed how neural stem cells without CHD5 become prematurely activated. The cells divide too fast, genes are inappropriately switched on, and new proteins are produced too soon. As a result, the stem cells are pushed down the wrong developmental path. Weeks later, by which time new neurons should have formed, most of those stem cells have become astrocytes instead. “When this happens in the brain,” Mills says, “there end up being too many of the cells that glue the brain together—the astrocytes—and not enough of the cells that allow us to see, feel, and think—the neurons.” As a consequence, a developing brain cannot wire up properly. Mills’ interest in CHD5 began more than a decade ago, when she discovered it as a gene that is frequently inactivated in human cancers. Brain cancers such as glioblastoma are characterized by an overabundance of astrocytes. “I hope that our research can lead to better treatments that could help glioblastoma patients—like the late John McCain, Ted Kennedy, and Beau Biden—defeat this deadly disease,” said Dr. Mills. Dong-Woo Hwang et al, “Chromatin-mediated translation dictates neural cell fate” is published on August 23, 2018 in Life Science Alliance.